Gabe McVarish hails from Northern California where he learned his first traditional tunes on the fiddle. Having twice won the U.S. Junior National Scottish Fiddle Championship by the age of seventeen, Gabe travelled to his ancestral homeland of the Scottish Highlands where he spent a year studying music under the tutelage of fiddler and tradition bearer Angus Grant Sr. After a couple of years spent travelling, busking and playing in Irish and Scottish pubs from Amsterdam to San Francisco, Gabe settled in the Highlands of Scotland. Having the opportunity to meet and play tunes with the wealth of great musicians in the area, Gabe was soon performing full time locally and internationally. The formation of Dáimh in 1998 was a milestone in Gabe's career. These likeminded local Lochaber musicians are now hailed as a "Gaelic super-group" having released four albums, touring extensively and appearing regularly on National TV and radio. After a three-winter sojourn in Glasgow, Gabe graduated from the Royal Scottish Academy of Music and Drama with a BA in Scottish Music in 2003. The subsequent years have seen Gabe greatly expand his skills, working as a session musician in studios from Ardgour to Edinburgh, and London’s Maida Vale. 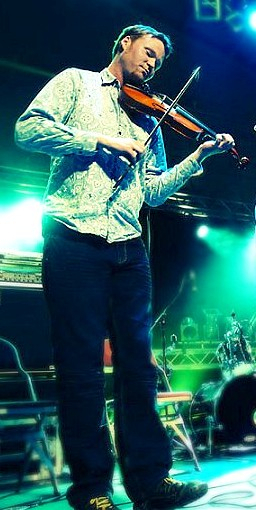 Gabe has played and recorded with a rich diversity of bands including Clíar, The Black Rose Ceilidh Band, Fiddlers 5, Kathleen MacInnes, and Ewan Robertson, and plays regularly with Dannsa. His versatility as a tutor has seen him highly sought after, having taught at festivals and higher education establishments including the University of Limerick. Gabe also teaches fiddle regularly in Lochaber. Gabe's critically acclaimed album Eclection is a culmination of fiddle styles and repertoire from every side of both the Atlantic and the Irish Sea, and Gabe’s love of the traditional music of the Celtic Diaspora shines throughout.